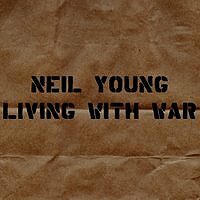 I'm listening to Neil Young's Living With War. That is how the AFL-CIO characterized CEO Hank McKinnell's compensation, according to the Financial Times. Since he took the top job at Pfizer in 2001, Mr. McKinnell has received $65 million in compensation and will receive an $83 million pension when he retires. During his tenure, Pfizer's shares have lost 46 percent of their value. In most settings, 20 percent opposition isn't much, but in elections to corporate boards, it's a big number, since it comes from mostly institutional investors. 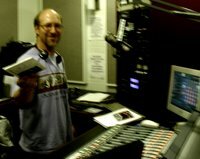 WVUD 91.3 is the only radio station in the area that doesn't restrict its DJs to a playlist. Weekday mornings are devoted to the Roots block with a terrific lineup of volunteers behind the mic. My personal favorites are Mark Taylor (pictured) on Thursdays and Scott Birney on Fridays. 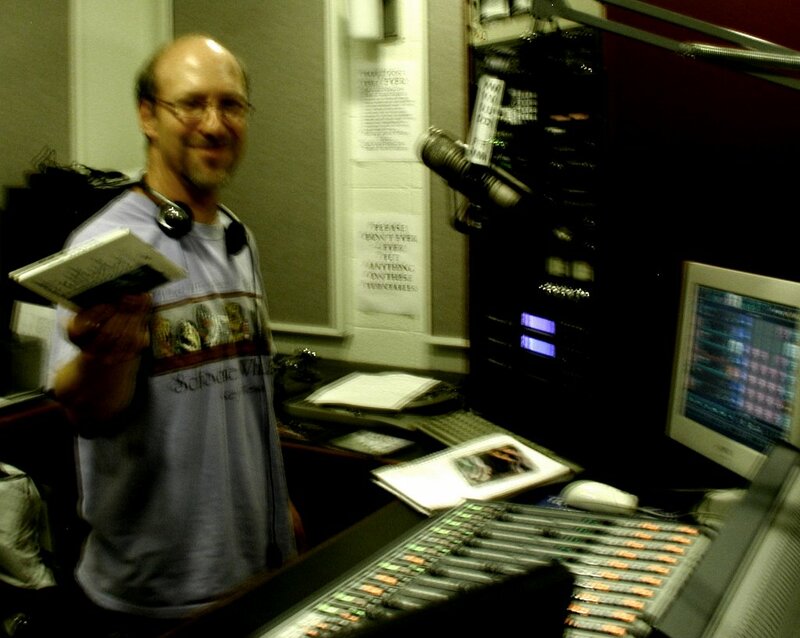 This is pledge week at WVUD, and for a modest donation, you can get yourself a Dream Hour: one hour on your favorite show playing music you like. I'm going on Mark's show next Thursday. You can show your support by calling the station at 302 831 2701. After posting on the death of Jane Jacobs, I checked in on Philadelphia Inquirer architecture critic Inga Saffron's blog Skyline Online and experienced an eerie moment of harmonic convergence. Eerie convergence or evidence of shared good taste? You decide. By the way, this coincidence prompted me to do what I have intended to do for some time, which is create a link to Skyline Online. I crossed paths with Inga a few time when I worked in Northern Liberties. 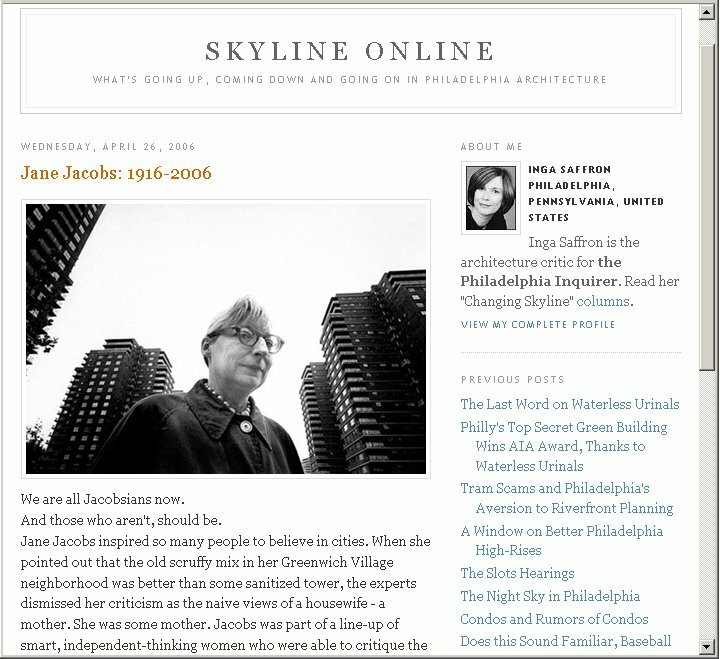 Philadelphia is fortunate to have an architecture critic who places herself so squarely in the Jacobsian tradition. This is post number 500 since Tommywonk went live on February 23, 2005. Tommywonk: Making the world a little wonkier one post at a time. The world is full of would be iconoclasts who never had an original thought. 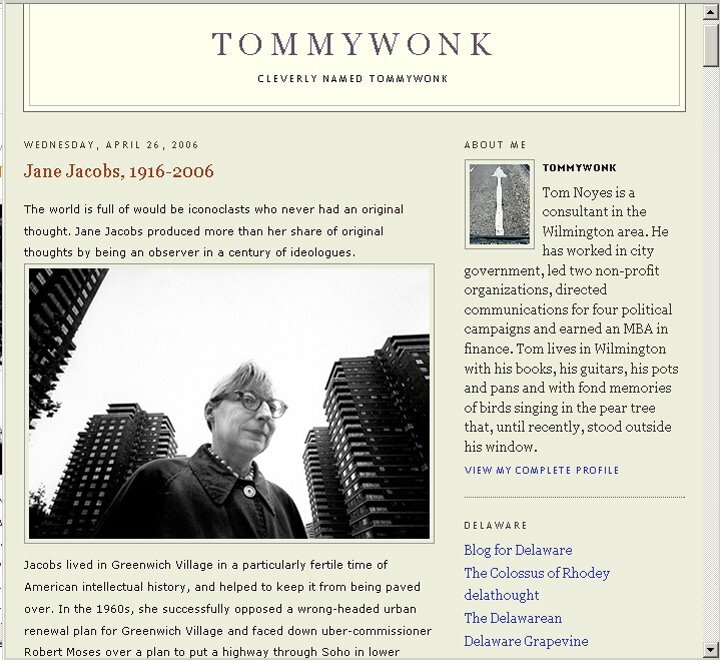 Jane Jacobs produced more than her share of original thoughts by being an observer in a century of ideologues. Jacobs lived in Greenwich Village in a particularly fertile time of American intellectual history, and helped to keep it from being paved over. In the 1960s, she successfully opposed a wrong-headed urban renewal plan for Greenwich Village and faced down uber-commissioner Robert Moses over a plan to put a highway through Soho in lower Manhattan. If Jacobs and her allies hadn’t opposed the powers that be, two of Manhattan’s most distinct neighborhoods would be very different today. In the 1950s and 1960s, the practioners of urban renewal, in thrall of the bigger-is-better vision of a relentlessly efficient, antiseptic, urban utopia, seemed determined to extinguish the remaining signs of life from our urban communities. This futuristic vision, fed by architects fond of building big projects, and financed with the corporate capital and the public works budgets of the postwar era, destroyed countless city neighborhoods. The philosopher Alfred North Whitehead wrote that Western philosophy is nothing more than “a series of footnotes to Plato.” It could be said that urban planning in our lifetime is nothing more than footnotes to Jane Jacobs. An exaggeration? Perhaps. But a book or article on urban planning that doesn’t take note of Jacob’s insights is inconceivable. This book is an attack on current city planning and rebuilding. Think of a city and what comes to mind? Its streets. If a city’s streets look interesting, the city looks interesting; if they look dull, the city looks dull. 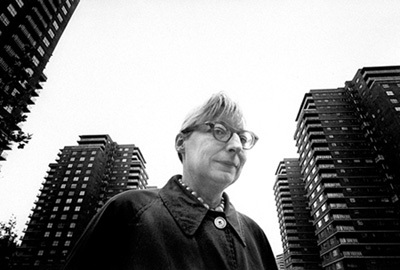 Jane Jacobs started in motion the return to the architecture of community and a turning away from what became known as brutalism. HUD has been replacing unsuccessful high-rise housing projects with community friendly mixed developments. New urbanists are building urban and suburban communities that incorporate the virtues that Jane Jacobs extolled. Death and Life presents other principles, like the value of mixed use and streetscapes that encourage interaction, that are now considered essential to creating and revitalizing neighborhoods. Transportation planning has changed. ISTEA (The Intermodal Surface Transportation Efficiency Act), adopted in the early 1990s, made it federal policy that transportation spending had to be about more than building roads. ISTEA retooled the way communities across the country organize their transportation investment to include such blindingly obvious insights that walking around is as important a mode of transportation as driving around. Zoning codes have changed. The City of Wilmington has, as part of its zoning code, a requirement that downtown buildings cannot present blank walls to the street. New Castle County’s Uniform Development Code is written to promote the virtues of community living, including basic items like sidewalks that allow residents to walk to the store around the corner. Simple? Perhaps. But in the 1960s and 1970s, suburbs were designed in such ways that required a person to get in a car to that to travel short distances. The corner store? You couldn’t get there from here. Classified telephone directories tell us the greatest single fact about cities: the immense numbers of parts that make up a city, and the immense diversity of those parts. However, in the face of so many nasty surprises, arising in so many different circumstances and under so many differing regimes, we must be suspicious that some basic assumption or other is in error, most likely an assumption so much taken for granted that it escapes identification and skepticism. Macro-economic theory does contain such an assumption. It is the idea that national economies are useful and salient entities for understanding how how economic life works and what its structure may be: that national economies and not some other entity provide the fundamental data for macro-economic analysis. Instead of nations, Jacobs proposed that city regions are the fundamental units for meaningful macroeconomic analysis, an observation that hardly seems remarkable today. Jacobs wrote with similar originality about the links between ecology and economics (The Nature of Economies) and the decline of Western rationalism (Dark Age Ahead). Systems of Survival is a fascinating look at the differences between coercive institutions and cultures (governments and systems based on enforcing laws and regulations) and market-based institutions and cultures based on mutual trust. 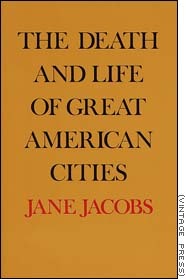 Our cities are better places and our intellectual life is richer because Jane Jacobs had an instinct for keen observation and thinking clearly that led her to challenge many of the erroneous assumptions about cities and economics that infected 20th century thought. We are all Jacobsians now. And those who aren't, should be. It has been 1,687 days since Osama bin Laden attacked the United States. It has been 1,090 days since President Bush pranced around on the deck of an aircraft carrier in a flightsuit under a banner that read "Mission Accomplished." Bin Laden is still at large. President Bush has decided he could use some advice on what to do about Iraq. The New York Times reports that Bush family fixer James A. Baker III is heading up a fact-finding mission to Iraq. "If you had a health problem, you'd want somebody to give you a second opinion," said Representative Frank R. Wolf, an influential Virginia Republican who helped recruit Mr. Baker for the job. "What the United States needs on Iraq is some fresh ideas from people able to speak out, and no one is more qualified to do that than Jim Baker." One can only wish that Bush had shown a greater interest in the facts before sending us to war in Iraq. What gives Mr. Baker's role weight, however, is that while he has never publicly deplored the decision to go to war, he wrote in his memoirs that he had opposed ousting Saddam Hussein in the Persian Gulf war in 1991 out of concern that it would have led to an Iraqi civil war, international resentment of the United States and eventual loss of American support for an occupation. He has told colleagues that he feels vindicated. Among their team are William J. Perry, a former defense secretary under President Clinton; former Mayor Rudolph W. Giuliani of New York; the former Supreme Court justice Sandra Day O'Connor; and Vernon E. Jordan Jr., a longtime civil rights leader, Washington power broker and confidant of President Clinton. An old joke: It's Earth Day; take a clod to lunch. Saturday is Earth Day, and many of you are asking how we can meet our growing energy needs while protecting our environment. The key is technology. So I have proposed the Advanced Energy Initiative to change the way we power our homes, businesses, and cars. Across the board, federal funding for energy efficiency is taking a major hit. In the White House's proposed 2007 budget, efficiency spending is down 17% overall from 2006 appropriations, and 25% from levels in 2002. The cuts are deeper for individual programs. Research to help industry reduce energy use is slated for a 30% decrease, and some programs are being shut down. On Monday, [House Speaker Dennis] Hastert and Bill Frist, Senate majority leader, will send letters urging the Justice Department and the Federal Trade Commission to immediately investigate alleged price gouging and market speculation. The issue of high oil prices is a difficult one for Republicans and President George W. Bush, who traditionally enjoy close relations with the energy industry. And, while it is unclear what steps the government can take to lower prices, politicians face mounting pressure to show their willingness to act. Crude oil prices hit a new record high of more than $75 a barrel yesterday, and petrol prices are above $3 per gallon in many parts of the country. That, in addition to the disclosure of a $400m retirement package for Lee Raymond, former chief executive of Exxon Mobil, has fed public rage at the oil industry. Under Carper's proposal, U.S. power plants would be required to reduce mercury emissions by 90 percent by 2015 and cap carbon dioxide levels at 2006 levels by the end of the decade. They would then be required to roll back these emissions to 2001 levels by 2015. In addition, the bill would require a more than 80 percent reduction in sulfur dioxide emissions and a 70 percent reduction in nitrogen oxide emissions by 2015. Meanwhile, the NRG Energy Co., which owns and operates the Indian River Power Plant near Millsboro, is talking about significant upgrades to the plant aimed at reducing pollution levels there. Carper made his announcement with the Indian River plant as his backdrop. Long said with new state pollution standards in the works, traditional pollution upgrades could cost hundreds of millions of dollars. Building a coal gasification plant would cost $1 billion, he said. "Therein lies the opportunity," he said. You mean you can make money improving the environment? Maybe someone could explain this to our MBA president. For instance, you probably didn’t know that the first person to die during the invasion of Iraq illegally came to America from Guatemala. His name was Jose Gutierrez. --People could be denied entry based on their political views. --If an immigration agent suspected anyone within 100 miles of a land border of being in the country illegally, they would have the power to have the person immediately deported without a trial. --In court hearings, "Secret evidence" could be used against immigrants, who would not have access to the evidence. --All children born to illegal immigrants in the United States would become wards of the state. --Housing of illegals would be considered a felony and subject to no less than 3 years in prison. Immigrant families do not come to the U.S. to undermine our values; they come to the U.S. because they embrace our values and are willing to work extremely hard to make a better life for themselves. The punitive House immigration bill is creating problems for Republicans, who have tried to court Latino voters and now risk alienating a growing population. Yes immigrants don't vote, but they are part of large communities of people who do vote. Arguments about immigrants not sharing "our culture" fail to appreciate the ways in which immigrants have wholeheartedly embrace American ideals. Dennis Spivack's blog is bracing reading. Every word is devoted to pointing out his differences with the incumbent. Taking on Mike Castle is a tough job, but Spivack is doing it full bore will clear, cogent arguments on why voters should retire the incumbent in order to kick out the corrupt, incompetent Republican regime in the House of Representatives. The memorandum begins by stating, "U.S. senior military leaders are involved to an unprecedented degree in every decision-making process in the Department of Defense." It says Mr. Rumsfeld has had 139 meetings with the Joint Chiefs of Staff since the start of 2005 and 208 meetings with the senior field commanders. How a precise accouting of the number of meetings he has held with top brass refutes the charge of micromanagment escapes me. The point of course, is not how often Rumsfeld meets with the top commanders, but that the war in Iraq isn't working despite his seemingly boundless capacity for self assurance in the face of contrary evidence. By the way, Reuters reports that Retired General Wesley Clark is now the seventh senior general to call for Rumsfeld's resignation. I think General Clark got his timing right by allowing other, less politically active colleagues speak ahead of him. "It's entrepreneurial returns for managerial conduct." "Exxon was there long before Mr. Raymond was there and will be there long after he leaves. Yet he received Rockefeller returns without taking the Rockefeller risk." One remarkable feature of his supersized compensation (the NYT calculated it to be $144,573 a day during his 12 year tenure) is that much of it remained undisclosed. He received $400 million in his last year with the company, including an imprssive $98 million pension. His 2005 compensation came to 6 cents per share. It's difficult to imagine the economic justification for pay on this scale. Would the pool of candidates for the top job be diminished if the pay were only, say, $100 million over twelve years? What is the marginal benefit to Exxon for the difference between $100 million and $400 million? Did this inflated total result in enhanced performance on the part of Mr. Raymond? "We are innocent. And by 'we' I mean Enron Corp.," Skilling said shortly before his lawyer, Daniel Petrocelli, finished his direct examination and court adjourned. "It was a fine company. I am innocent of all of these charges, and I will fight for that for a long time." He called for others to take a stand, as well. "Unless someone takes a stand, and I think Ken (Lay) and I are taking a stand, they are going to feel that they were tricked. Perhaps, but tricked by whom? "I'm sorry. I have to calm down here a little bit," Skilling said, pulling back. "Is it difficult at times to contain how upset you are?" Petrocelli asked, guiding his client to a subject that usually elicits great anger and emotion from Skilling. "Yes, at times, yes," Skilling replied. This may be an astute bit of innoculation on Petrocelli's part. I imagine that prosecutors will be working hard to get under his skin when they begin their cross examination on Monday. The problem for Skilling is that he has consistently blamed everyone but himself for Enron's woes. To the extent that his defense is based on convincing jurors that there was nothing wrong with Enron, and that the company's woes are entirely the fault of short sellers, business journalists, Andy Fastow (whom Skilling made CEO) and the government, all colluding to bring down his beloved Enron. He still thinks people "don't get it." "Did you ever have a single conversation with someone at Enron in which you said, 'We're not cutting it, we've got to break the law. Do it!' ?" Petrocelli asked. "No," Skilling replied. "I don't think I did anything remotely like that." Skilling is that he has kept his temper in check under the gentle questioning of his lawyer. I'm guessing that prosecutors are looking to get under Skilling's thin skin when they get a crack at him. I'm waiting for Skilling to tell the government they just don't get it. Mr. Skilling said Monday that short sellers and The Wall Street Journal had an organized campaign to damage the company. He said that after he left Enron he was "thrilled with the operating performance" of the company. But in October, The Wall Street Journal began writing articles questioning Mr. Fastow's LJM partnerships. One wonders how credible the jury will find this upbeat assessment of Enron's financial condition after weeks of testimony describing the company's problems. The Washington Post reports that Special Counsel Patrick Fitzgerald has described a "concerted action" in the White House to discredit critics of the intelligence used to take us to war. The ringleader? A review of the records and interviews conducted during and after the crucial period in June and July of 2003 also show that what the aide, I. Lewis Libby Jr., said he was authorized to portray as a "key judgment" by intelligence officers had in fact been given much less prominence in the most important assessment of Iraq's weapons capability. Mr. Libby said he drew on that report, the October 2002 National Intelligence Estimate on Iraq, when he spoke with the reporter. However, the conclusions about Mr. Hussein's search for uranium appear to have been buried deeper in the report in part because of doubts about their reliability. The concerted effort was designed to impune the credibility of those who questioned the relentless march to war. Now it's the credibility of those leading us to war that is at an all time low. I have long thought that the damage done to our national interest by BushCo's economic policy was as bad or worse than the damage done by the debacle in Iraq. So I was delighted to see the news that Robert Rubin and some of his most prominent colleagues from the Clinton administration had created the Hamilton Project to do the serious work of figuring out how to undo the BushCo mess and return us to the path of increasing prosperity that benefits all segments of society. One might think that Democratic Party activists would welcome such a contribution from a national figure with the credibility of Robert Rubin, particularly given the project's conviction that "broad-based economic growth participation is stronger and more sustainable." Now reasonable people can disagree about issues such as the country's trade policy, but to cast such a disagreement as a war on progressives seems less than useful. Why go back and fight Clintonism when we've been out of power for five years? Meanwhile, those who are in power have frittered away the federal budget surplus and undermined the policies that created eight years of economic growth that in fact did benefit a broad range of Americans. I admit I'm prejudiced about Robert Rubin: I spent the Clinton years in city government, while Wilmington's overall prosperity rose as it hadn't done in in several decades. That's what's been bugging me since yesterday, when DeLay looked more like a man taking a victory lap than one resigning in disgrace. Maybe that's because, in his mind, he has won -- by reshaping Washington to fit his brutally partisan style. 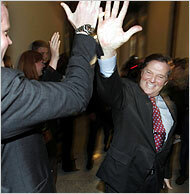 In Tom DeLay's world, his indictment on ethics charges is just another skirmish in his political career. For him, there is no right or wrong, just winning and losing. John Boehner, his replacement as Republican leader, called Mr DeLay "one of the most effective and gifted leaders the Republican party has ever known", adding that hehas "served our nation with integrity and honour". The two have similarly close ties to the K Street corridor where many of Washington's top lobbyists reside. A congressional watchdog group last month coined the phrase "a Boehner tan", saying the new leader has taken dozens of trips to sunny golfing destinations, paid for by funds raised from lobbyists.